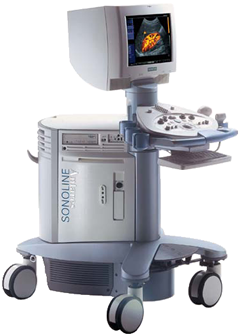 The Siemens Sonoline Antares ultrasound is uniquely engineered to meet the needs and demands of innovative, fast-paced imaging environments. With this multi-purpose ultrasound, users can discover innovative imaging solutions, increased ultrasound performance, streamlined clinical workflow, and upgradeability. In terms of performance, the Siemens Sonoline Antares ultrasound offers fully integrated premium capabilities including superb 2D, 3D, 4D and Doppler imaging. Other imaging features include the super-fast GigaProcessing Technology and the patented Crescendo Multi-Dimensional Image process for the highest level of image quality. Through the system’s open architecture, it’s easy to upgrade the software and hardware and ensure that you get the most value for your investment. After taking images, the Siemens Sonoline Antares ultrasound offers advanced image processing as well as data and image management functionality through its DIMAQ-IP Integrated Workstation. Operators can also expect optimal comfort and usability with this ultrasound’s ErgoDynamic Design.